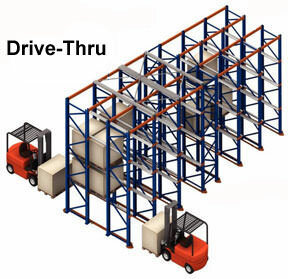 Drive Thru Pallet Racking which is also coined as Drive In Racking uses the same racking system with a major differentiation. Drive thru pallet racking has separate entry and exit points. Products are rotated on a FIFO(First In First Out) basis.Drive in Racking has the same entry and exit points. The product rotation uses the LIFO(Last In First Out Method). Both the configuration of pallet racking provide high density storage and hence has a quicker ROI. Has separate loading and unloading aisles. Products are rotated on the racks on FIFO basis. Ideal high density storage solution for date sensitive products. Food, chemicals, beauty products, medical and any other perishable products. Has same loading and unloading Aisle. Products are rotated on the racks on LIFO basis. Ideal high density storage solution for date insensitive products. Footwear, media, plastic components, toys, home wares etc. Call us on 02 9482 4288 or fill the contact form below to discuss your requirements. Our warehouses are based in Hornsby and Blacktown in the Sydney Region. We supply and install pallet racking at great prices. Our customer base cover Sydney region as well as Interstate.